A loan of $675 helped to buy fertilizers and other farm supplies. Adelaida is 66 years old and married with five children. She earns a living by farming rice in the Philippines. 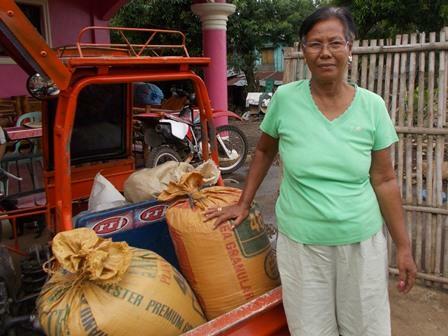 Adelaida is borrowing 29,500 Philippines Pesos (PHP) through NWTF in order to buy fertilizers and other farm supplies. Adelaida has been farming rice for 15 years and also earns additional income from pig fattening. She is working tirelessly toward the attainment of her dream, to save enough money to expand her business. Negros Women for Tomorrow Foundation (NWTF) is a non-governmental organization established with the aim to help women achieve self-sufficiency, particularly in the province of Negros Occidental's low-income communities. The organization offers its clients a wide variety of products, including loans for micro-entrepreneurs, hospital income benefits, life insurance, accidental death benefits and more. Kiva lenders' funds will be used to expand the reach of these products to low-income urban and rural communities. Kiva partners with NWTF due to the organization’s outreach to women in rural communities. NWTF also continues to conduct research on the satisfaction of its clients and staff, and has been especially attentive to issues of social responsibility. Additionally, it views commitments to environmental responsibility as an essential part of its operations.